Children will love their miniature stature; they are little enough to be carried around. But it is because of their size that they are a dangerous combination with little children. Your child will not be able to understand how fragile your Maltese is. It's easy to seriously injure a Maltese by standing on it, or accidentally sitting on it. The "teacup" variety three pounds and under is a very bad dog to have with children. These dogs are too small and as a result their bones are extremely frail and brittle. It's an unfortunate result of their small size - their bones break easily. They can far too easily be injured accidentally. Standing or sitting on your Maltese can seriously injure your dog. You will need to teach your children how to treat your Maltese. This includes strictly enforcing a "no roughousing with the dog rule". The kids must learn that your Maltese is fragile and should be treated as such. Just don't leave your children unsupervised around a Maltese. Even though the child may mean well, that will not stop the Maltese from becoming agitated. 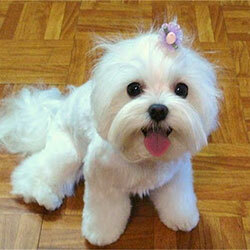 Some can be a little snappish, so look for a Maltese where the parents are a little mild mannered. This will reduce the risk of any problems. Overall Maltese make a great family pet.